It's not solely a music venue, but 7th West is delivering plenty of live tunes and dance parties with a focus on people of color. 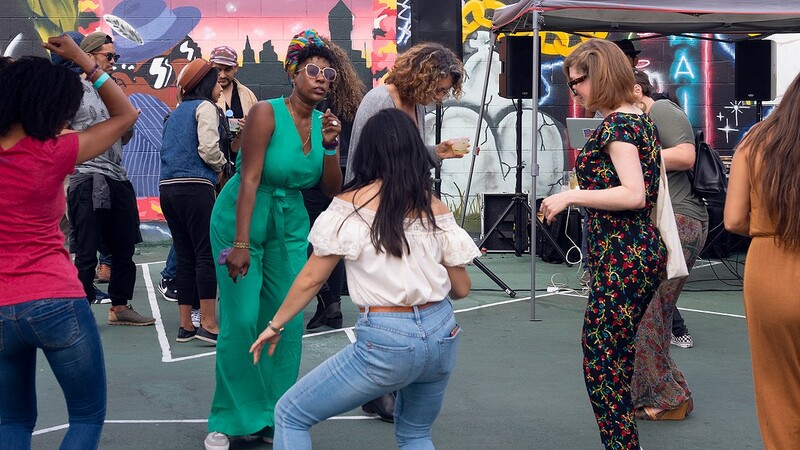 Makossa Cookout recently brought DJs and dancing to 7th West. If you show up to 7th West's 7th Street address, chances are you'll feel like you've stumbled into the wrong place. From the sidewalk, it looks like a massive, unmarked gray cube. There is no sign announcing its name and purpose nor is there an immediately obvious entry point. It's actually around the corner, at the venue's Union Street-adjacent wall emblazoned with a mural by TDK Collective, one of Oakland's oldest graffiti crews, that things start falling into place. If you follow the mural all the way down, around the next corner you'll find yet another mural by artists from 3-year-old Good Mother Gallery in downtown Oakland. It's this meeting — sometimes literal, often figurative — of Oakland subcultures old and new that 7th West co-owner Kevin Pelgone hopes to foster within the space. "7th West is meant to be an homage to old Oakland as much as it is an understanding that new Oakland is adapting and changing," Pelgone said. Of course, this nuanced understanding of the waves of subcultures that have flowed through Oakland — and how best to meld them together — doesn't come out of thin air. The venue itself has been 11 months in the making. Meanwhile, each of 7th West's co-owners — Pelgone, Donna Inscho Brinkman, Assan Jethmal, and Pancho Kachingwe — had been active in the Oakland nightlife and art space scene for years before as bar and club owners, event curators, and even as musicians. "We've been in Oakland for a while, like each and every single one of us," Pelgone said, "so we understand the culture much more than like a business guy from San Francisco that's trying to start something in Oakland." Since opening in late August, the space has come to house a little bit of everything. It's a bar, yes, and a restaurant, but it's also an old-school arcade and a beer garden. It has a dance floor too, and a beautiful patio for watching the sun set, but above all it's a community space. And while operating as a music venue may not have been 7th West's primary goal, it books a lot of live performances and DJ acts. For now, 7th West tries to put on music-oriented events two to three days a week — just often enough that the space can be a hub for live music, but not so often that it is identified as a music venue above all else. So far, 7th West has hosted Cumbia nights, DJ sets by DJ crew Cheat Day, and the first Oakland edition of the famous Makossa Cookout in recent years — and almost all cover-free, too. "If I looked at my curation objectively, we basically cater to POC subcultures," Pelgone said of the calendar, hardly narrowing the scope of who can be found playing at the venue on any given night. From blues bands that harken back to 1940s West Oakland to anime-influenced SoundCloud DJs, just about every genre could find itself into the venue at some point or another. Pelgone also curates the entertainment with the aim of promoting Asian-American empowerment. Three of the venue's four owners as well as chef Dennis Villafranca are of Filipino heritage. While events made by and for POC communities are abundant in Oakland, Pelgone said it's hard to come by one that specifically celebrates Asian-American culture. And it's not just the music. Take the anime party night that 7th West has on its radar for an example. Pelgone's vision for the event expands far beyond just inviting a few DJs to play to the crowd. It's inviting an art designer to fill the screens set up around the venue and offering a special menu complete with boba cocktails. 7th West's vision of itself is as a community space with a number of moving parts that can work independently, but perhaps the most important part of this vision is that these moving parts can all come together to work as a coherent whole when it's time to put on an event for the community. The blues and jazz clubs and venues that thrived on 7th Street back in the 1940s may have all but disappeared. In the past few years, though, a new set of music-oriented ventures from 7th West to Blue Dream, the private events space that's opened up down the block, to Zoo Labs, which hosts musician residencies modelled after startup accelerator programs, have cropped up in their place. What separates 7th West from the pack is that it's actively understood to be a safe space for the community. The tagline, "come together," is taken as a literal invitation rather than just a nicety. According to Pelgone, even on casual evenings when the space is open just as a bar and restaurant, prominent Oakland DJs and musicians from Fantastic Negrito to Boots Riley have popped in for a quick drink.